This collection of stories is about the bold and brave women who have made a positive impact on the world before even hitting the age of 20. Coming from the New York Times best-selling authors of Rad Women Worldwide and Rad American Women A-Z, Rad Girls Can offers up an inspiring collection of stories and art. While you might have heard of Malala Yousafzai, Anne Frank, Jazz Jennings, and Joan of Arc, have you heard about Yusra Mardini, the Syrian refugee who swam a sinking boat to shore, saved twenty lives, then went on to compete as an Olympic swimmer? Or Trisha Prabhu, who invented an anti-cyberbullying app at age 13? Discover stories about a diverse group of women, living impressive lives, and excelling in male-dominated arenas from sports to social changemakers. Each profile by the authors includes dynamic paper-cut art that brings these stories to life. This New York Times bestseller delivers a story that will inspire women like never before. Throughout the years, women have been shaped and molded into societal predicaments, yet within every woman there lives a powerful force, filled with good instinct, passionate creativity and ageless knowing. Yes, she’s a wild woman, but she is endangered by modern society. In Women Who Run with the Wolves, Dr. Clarissa Pinkola Estés unfolds rich intercultural myths, fairy tales, folk tales, and stories, many from her own traditions, in order to help women reconnect with the fierce, healthy, visionary attributes of this instinctual nature. Through the stories and commentaries in this remarkable book, we retrieve, examine, love, and understand the Wild Woman, and hold her against our deep psyches as one who is both magic and medicine. In this day and age, finding heroes or role models that we can connect to is becoming more difficult. Still I Rise takes its title from Maya Angelou’s work, resonating with spirits and heroes that could not be conquered by oppression. From Angelou to Nelson Mandela, Still I Rise speaks to a women captain of her own fate. 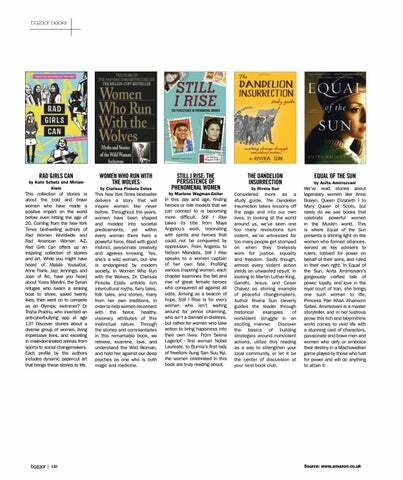 Profiling various inspiring women, each chapter examines the fall and rise of great female heroes who conquered all against all odds. Arriving as a beacon of hope, Still I Rise is for every woman who isn’t waiting around for prince charming, who isn’t a damsel in distress, but rather for women who take action to bring happiness into their own lives. From Selma Lagerlof - first woman Nobel Laureate, to Burma’s first lady of freedom Aung San Suu Kyi, the women celebrated in this book are truly reading about. Considered more as a study guide, The Dandelion Insurrection takes lessons off the page and into our own lives. In looking at the world around us, we’ve seen one too many revolutions turn violent, we’ve witnessed far too many people get stomped on when they tirelessly work for justice, equality and freedom. Sadly though, almost every violent action yields an unwanted result. In looking to Martin Luther King, Gandhi, Jesus, and Cesar Chavez as shining example of peaceful changemakers, Author Rivera Sun cleverly guides the reader through historical examples of nonviolent struggle in an exciting manner. Discover the basics of building strategies around nonviolent actions, utilize this reading as a way to strengthen your local community, or let it be the center of discussion at your nest book club. We’ve read stories about legendary women like Anne Boleyn, Queen Elizabeth I to Mary Queen of Scots, but rarely do we see books that celebrate powerful women in the Muslim world. This is where Equal of the Sun presents a shining light on the women who formed alliances, served as key advisers to rulers, lobbied for power on behalf of their sons, and ruled in their own right. In Equal of the Sun, Anita Amirrezvani’s gorgeously crafted tale of power, loyalty, and love in the royal court of Iran, she brings one such woman to life, Princess Pari Khan Khanoom Safavi. Amirrezvani is a master storyteller, and in her lustrous prose this rich and labyrinthine world comes to vivid life with a stunning cast of characters, passionate and brave men and women who defy or embrace their destiny in a Machiavellian game played by those who lust for power and will do anything to attain it.